You are currently browsing the tag archive for the ‘White House’ tag. Fox News saw its rise during the tumultuous years of the Clinton presidency. They, in other words, made their name by being the anti-Clinton “news” organization. During the eight years of the Bush presidency, they became the cheerleaders of the Bush policies, most notably the invasion of Iraq. And now Fox News is in the business of distributing misinformation, lies, and conspiracy theories. Fox News even took it upon themselves to promote the TEA Party rallies, which were held all across our country and in our nation’s captial. At these rallies, “real Americans” accused the President of violating the Constitution, devising death panels to kill senior citizens and the disabled, and of being (somehow) a Nazi, fascist, socialist, marxist, and communist. Fox News has become the chief promoter of this insanity, neglecting any sense of journalistic ethic to be objective in its reporting, let alone attempting to do any fact checking. With that said, I do not feel that it is a great idea for the White House to engage Fox News in a war of words. Hannity, for instance, loves the battle. He is now advertising his show as being “Not White House Approved,” implying that it was White House approved during the Bush years. The network has taken advantage of the White House attacks in order to generate more viewership and to play the role of victim. They are also crying foul: the Obama White House is attacking Fox because they are asking “tough questions” and “reporting the truth.” Never mind that they instigated the war on the White House from day one. I know that I will be boycotting Fox News. I hope that you will join me! Show your support and sign your name in the comment section! Yes, ladies and gentlemen, Glenn Beck is a racist. He’s also a communist and a fascist. And he hates America. There. I said it. And I feel much better for it. What’s my proof? Well, I have tons of made up facts and paranoid delusions to support my assertions. Isn’t that how Beck and his kind operate? No facts; only baseless assertions supported by “facts” that have been twisted and perverted to fit his narrow view of the world. Glen Beck is a racist. Not really, but he is. No, that’s not the reason (though Beck has had no problem calling the President a racist). It turns out that Van Jones is the founder of an advocacy group called Color of Change, which has been running a successful campaign to force advertisers to drop their sponsorship of Beck’s show on the Fox network. So far, 57 have jumped the crazy ship lollypop. What caused the group to start their campaign? Beck’s racist comments: President Obama is “a racist” and has a “deep-seated hatred for white people.” Well, that sounds like totally rational and legitimate debate. But Beck was beating this drum before the Color of Change campaign, on July 23rd and July 28th. On July 23rd, Beck devoted a small amount of time on Jones’ efforts to create a “green” economy, which would create “green” jobs. He also described Jones as a “communist.” I know, I know– what a horrible person, right? Trying to give people jobs in the private sector while combating Global Climate Change sooooooo makes him a communist. On July 28th, Beck had on his show an “expert” named Phil Kerpen from the conservative think-tank Americans for prosperity. These two nut-jobs went on to weave a complex and convoluded conspiratorial web of lies and speculation, one that included Color of Change, the Apollo Alliance, and ACORN. These progressive groups, who advocate for social justice and equality, are apparently communists who want to overturn the system. Is it true Apollo helped design the stimulus package? KERPEN: They did. They put out a draft stimulus bill last year in 2008. It included almost everything that ended up being in the final stimulus bill. Harry Reid has thanked them for helping design the final stimulus package that was enacted into law. And they brag on their Web site that they helped design this thing and push it through. I love it when people who are trying to help the poor and disadvantaged are branded as communists who hate freedom and America. Glenn Beck is a racist. Yeah, I know I said it earlier, but I was joking. Now I’m serious. He may not know he’s a racist, but he is– at least on a sub conscious level. Not only has he called our first African American President a racist with deep seated hatred for white people, but he is also curiously focused on Jones’ early years, trying to portray him as a radical black nationalist. Even his attacks on Color of Change and ACORN, groups that are aimed at bettering the lives of minorities in urban areas, seem to be racially motivated. He sees dark skinned people rising to positions of power and he is scared shitless. Why does Beck avoid answering the question? Because Jones did renounce his early views. Certainly, Jones did brand himself as a communist. When he was jailed(improperly) following the riots of the Rodney King trial, Jones encountered revolutionary people with radical ideas. “I spent the next ten years of my life working with a lot of those people I met in jail, trying to be a revolutionary… I was a rowdy nationalist on April 28th, and then the verdicts came down on April 29th. By August, I was a communist.” This is the quote that Beck refers to constantly. Unfortunately, he never mentions the rest of the story. After working in 2000 against Prop 21 (designed to impose stricter sentences on criminals) he faced a tremendous inner struggle when the Proposition passed and his revolutionary group imploded. As Eva Paterson (a mentor to Jones in his early years) wrote, “I counseled him to rethink his tactics and to work for change in wiser ways. In time, he jettisoned his youthful notions and moved on to seek more effective and attainable solutions.” Jones looked around and saw that there were other ways to achieve social progress: “I realized that there are a lot of people who are capitalists — shudder, shudder — who are really committed to fairly significant change in the economy, and were having bigger impacts than me and a lot of my friends with our protest signs.” So, Jones renounced his radical ways and accepted a different path: “Now, I put the issues and constituencies first. I’ll work with anybody, I’ll fight anybody if it will push our issues forward. … I’m willing to forgo the cheap satisfaction of the radical pose for the deep satisfaction of radical ends.” It was also at this time that Jones turned to God and returned to his Christian faith. Within the last year, Jones also published a book titled, “The Green Collar Economy: How One Solution Can fix Our Two Biggest Problems.” Note that the book is a capitalist approach to solving our unemployment problem as well as our Climate Change problem. Another of Beck’s otrageous claims is that Jones is a convicted felon, who was part of the race riots following the Rodney King trial. While it is true that Jones was arrested, his characterization is false and dishonest. On May 8, 1992, the week AFTER the Rodney King disturbances, I sent a staff attorney and Van out to be legal monitors at a peaceful march in San Francisco. The local police, perhaps understandably nervous, stopped the march and arrested hundreds of people — including all the legal monitors. The matter was quickly sorted out; Van and my staff attorney were released within a few hours. All charges against them were dropped. Van was part of a successful class action lawsuit later; the City of San Francisco ultimately compensated him financially for his unjust arrest (a rare outcome). So, it is completely false and wrong for Beck to continue to portray Jones as a felon. Van Jones is an individual who has made it his life’s work to fight for social change, social justice. His tactics and beliefs were radical and revolutionary, but he has long since change his ways, though social change and justice are still his goal. He is someone who has a powerful presence, who empowers people to become the chage they want to see. It was this work, particularly his efforts to create a “green” economy that caught the eye of the Obama administration. Despite Beck’s claim that Jones is a “Green Jobs Czar,” Jones is really nothing more than a low-level advisor. The term “Czar” is one that has been used by the media, though never used by the Obama administration. 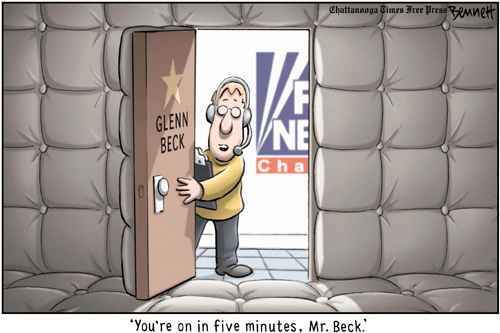 Beck loves using the word, as though it implies some level of shady business. In reality, Jones is an intelligent, passionate, and dynamic individual who wants to make a difference.